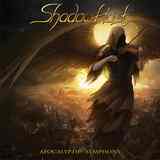 For the first couple of times I heard Apocalyptic Symphony by Shadow Host, I would tend to put the album “till later”, but now came the time these Russians get some publicity. Frankly, I would not know the reason I could not get into Apocalyptic Symphony right away. It is definitely on me, as Shadow Host offer up a rather catchy blend of thrash and heavier lean power metal, very much unchanged after the band’s 20+ yrs being in existence. By using well-known building blocks the band creates rather competent, well-produced and likeable (for me it was, eventually) material. In short, then, Apocalyptic Symphony is pretty basic, but its straightforwardness will get to you, and I can see many fans falling in love with the album. The opener Lunacy Divine may be starting a little slower, but then the crunchy riffs prove to have fire in them, burning both fast and a little slower, mid-song brooding breakdowns present elsewhere on Apocalyptic Symphony. If things were left at Lunacy Divine, Shadow Host would be akin to early Blind Guardian, before all of the vocal layerings and operatics, when guitars was Blind Guardian’s unquestionable centerpiece. Darker shade melodic thrash is not, however, where Shadow Host stops, and after Lunacy Divine is over they proceed to get harder and stiffer, still invoking Teutonic thrash masters, only of slightly different ilk. Sodom and Kreator should be proud of inspiring Shadow Host, uncorking song after song of helicopter tight riffs, certain level brutality, alternating D-beating blasts and rolling double bass rhythms, shouted vocals, muddy harmonies and catchy choruses (Reborn in Hate, Guardians of the Wretched, Silent Killing, Blinded by Greed, Treason). Heck, if the originators run out of energy they can look back to the imitators to get some of it back. Shadow Host just does not stop, not giving respite from the breakneck tempos until the 7th cut Divide and Rule, where they finally display what they can do with the slower material, laying persistently into melodic verse. The only other not rapidfire song on the album is the ballad Seeds of Sorrow. With its acoustic beginning, coarse voice and Splenda-like melodic chorus, Shadow Host draws reference to early Iced Earth as well. Not to leave us confused about their most basic instincts, however, Shadow Host return to their bread-and-butter on the closer Apocalypse Within, marrying Metallica opening riff, Blind Guardian melodic leads and chorus with dual guitar harmonics. Low on pretense, and big on gut punching, even if with the similar repeating maneuvers, Apocalyptic Symphony should be more of an immediate simple draw than what it was for me at the beginning. This one also goes down well on a good sunny fall day, when you feel combative and confident in whatever it is you are about to approach.